Welcome to the world of Pokemon! Pallet Town is the humble beginning of your adventures, and here you will find your first Pokemon to accompany you to the region of Kanto. Let's start the show! 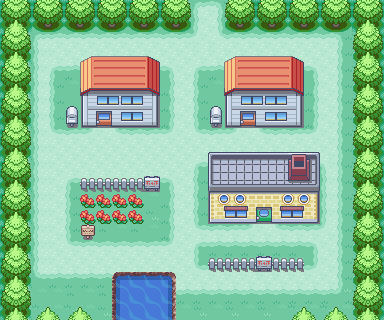 Pallet Town might seem like any other humble hamlet, but someday the whole world will know that this was where you began your quest to become the greatest Pokémon trainer ever! The famous Professor Oak, known for his Pokémon studies, also lives in Pallet Town. He'll give you your very first Pokémon. That's one down, 150 more Pokémon to go! Grab a Potion out of the computer in your room just in case your rival puts up a good fight. And if your Pokémon get hurt, Mom will heal 'em for free. Bulbasaur and Squirtle are good choices for beginners, however Squirtle will have harder time against later gyms. Charmander is a choice for more experienced players, because he will have a tough time against the first two gym leaders. You start off your task by looking in the obvious place: the research lab. But oddly enough, he isn't there. So you check your rivals home, but you only find his sister. Professor Oak seems to have left town. Maybe you should head out in search of him. But the moment that you set one foot outside of town, someone calls to you and warns you not to go. It's Professor Oak! Professor Oak brings you back to the lab and, after assembling together with your rival, offers you the choice of three Pokémon from which you will select your very first. Choose carefully: Not only will the Pokémon you pick be your strongest ally for the next few hours, it will also determine which Pokémon your rival picks as well. Your lifelong rival, Blue, isn't home, but his sister is. Blue carries a grudge against you, but his sister thinks you're OK. If you stop by a little later, she'll give you a useful item, no matter what Blue says. With your first Pokémon in hand, and an eagerness to start your journey, you head for the exit. But before you can leave, your rival decides that he wants to test his mettle against you and challenges you to a duel which you can not refuse. You'll have a tough match ahead of you, since your rival has shrewdly chosen the Pokémon that has an advantage over yours. Fortunately, your rival isn't much of a fighter, and wastes time with defensive techniques like Growl and Tail Whip instead of just choosing the attacks and going for the quick K.O. If you start to run low on health, feel free to use that Potion you picked up from your room; you can get a free one to replace it soon. If you lose, though, no big deal: All you miss out on is your rival's 80 and a free level up, but you'll get plenty of opportunities for a rematch. Once the fight is complete, you're ready to leave town and travel along Route #1. Bulbasaur double specializes in Grass and Poison, so he's good versus a variety of foes. He lacks usable an offensive movepool though, and his STAB attacks don't do much against common Poison-type Pokémon in the game. However, he has a great support movepool, including Leech Seed (learned at level 7) and all status powders. If you pick him, your rival will take Charmander, who's great against Grass. Water-based Squirtle is tough on defense but his attacks have somewhat modest power. Still, his aquatic attacks are effective against Fire-type enemies and the soon-to-be very annoying Rock- and Ground-type Pokémon. He can learn Surf by HM, which sports good power (and 100% accuracy) and is essential for going by waterways. If you take him, your rival will pick Bulbasaur, who is good against Water-types. Charmander shines on offense: as a Fire-type Pokémon, he learns powerful Fire attacks and other useful moves. However, his defensive capabilities are much worse than the other two's, so he can be killed easily by powerful attacks. Should you choose him, your rival will pick Squirtle. This page was last edited on 14 July 2017, at 01:42. This page has been accessed 236,115 times.